Companies and design firms are using seat sensors, infrared cameras, footfall trackers and surveys as they develop office designs that not only optimize the space but also improve the employee experience. CHICAGO — The rise of the open-office concept has been met, of late, with predictions of its fall. That’s a change from the process that led to the open-office explosion, when employers tore down cubicle walls and axed private offices mostly to keep up with the cool technology firms and save money on square footage, without much consideration of the potential pitfalls for workers, said Elizabeth Dukes, co-founder and chief marketing officer at iOffice, a facilities management software firm. The people focus has become necessary because technology allows employees to work from anywhere, so offices have to be not only attractive, but also “crave-able,” to get people to come in, said Ed Nolan, managing director of workplace strategy at Chicago-based real-estate company JLL. “Employers want a level of vibrancy and buzz in the environment,” Nolan said. The most sophisticated clients are thinking not just about the space but also the work experience, which entails having reliable technology in the right places, comfortable temperatures and conference rooms available when you need them — basic needs that are often not met, he said. Gensler’s Chicago office, a pioneer of the open, doorless concept 12 years ago, is bursting with data as the architecture firm plans a redesign and expansion of its own workspace. A messy backroom in an unfinished part of the office called the “white space” is where teams with confidential projects sometimes hide away to work. 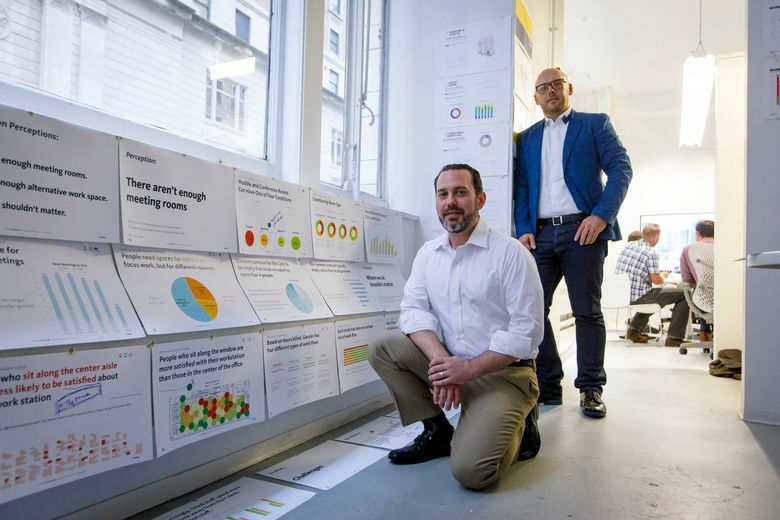 The walls are covered with charts and graphs analyzing foot-traffic patterns, meeting-room use and employee perceptions, as well as renderings of the future office that was designed with those findings in mind. The goal for Gensler is to organize teams to be more nimble and create a more interactive experience for clients, including a design lab and virtual reality lounge. But its office also is serving as a laboratory of sorts to test possibilities for clients. At Gensler, employee survey and observation data were combined with data from infrared cameras in meeting rooms that detect occupancy, footfall trackers along corridors that measure traffic, and analyses of Wi-Fi logins, badge-ins at security and email traffic between employees. This created a picture of when and how employees were interacting with each other and the various spaces. Take the exposed brick wall that slices through the center of a sea of white desks. The data showed it had become a natural gathering place for people who bump into each other on their way to meeting rooms and amenities, a dream result for proponents of open-concept plans hoping to encourage serendipitous encounters — but a nightmare for employees trying to get work done at nearby desks. “For individual desk spaces, it was a real hindrance to satisfaction,” economist Wes LeBlanc, analytics director at Gensler, said as he pointed to a chart with red spots depicting low-satisfaction zones in what he calls the “flyover areas” along the central aisle of the office. In the new design, individual workstations will move away from the brick wall, and a “collaboration zone” for quick and impromptu meetings will move in. Doors will be added to huddle rooms, small glass-enclosed nooks that are now partially open, to provide more quiet spaces for heads-down focus work. A mosaic floor rotunda had the opposite problem: Data showed no one used it because the sofas were too low and the room had no electrical outlets. Similarly, seat sensors in the formal chairs in the reception area showed no one sat in those, either. “If people say open office is dead, I would say lounge furniture in open office is dead,” Heiser said. In the new design, the reception area will feature a long work table where people can pull up a chair, and the rotunda will be a quiet, technology-free space with a long bar where people can work. All lounge furniture will be paired with a table. The rise of data analysis comes alongside the rise of what’s been termed “activity-based working,” which scraps assigned desks for certain groups of employees and instead offers a variety of spaces for different activities — huddle spaces for focused work, collaborative zones for team meetings — as well as the technology and processes that help employees use it. Siemens, the German industrial manufacturing conglomerate, five years ago started transitioning many of its U.S. offices to that dynamic environment for teams that are highly mobile, like sales. A quarter of the 37 million square feet of office space it has under management in the Americas has adopted the “New Way of Working” concept, said Michael Kruklinski, head of Region Americas for Siemens Real Estate. The aim is for a desk-to-employee ratio at those offices of 1:1.5. The company is also piloting infrared sensors in the ceilings at three of its U.S. offices to get a firmer handle on the types of spaces people gravitate to. The sensors create a heat map, with 90 percent accuracy, that reveals how many bodies are in an area or room, important for knowing whether a conference room meant for 13 people is hosting a lot of two-person meetings, which could indicate a need for more small meeting rooms. The data in Siemens’ Chicago office revealed that less than two-thirds of employees are in the office at peak times, indicating that there is room to add staff without moving or leasing more space, Kruklinski said. Also, the sensors found, people gravitated toward high-top tables as well as height-adjustable desks so they can sit or stand. “You don’t have to make decisions based on anecdotes, we will have six months of data for several sites and will actually make decisions based on this data,” Kruklinski said. The sensors serve an additional safety purpose, he said, because they reveal what rooms people may be in during an emergency.